Mark and Daisy make their triumphant return on The Following Season 3 Episode 9, but there's a twist! Luke has taken over Mark's mind and body, but as Daisy discovered, Mark is still in there. That was a pretty smart move on her part. Luckily for Daisy, she managed to keep herself alive by showing Mark/Luke that the cameras were still active in Max's apartment. So, does that mean Daisy's been watching Max this whole time, too? How else would she have known the cameras were still active? Speaking of the cameras, Mike and Max finally learn about the laptop's existence and manage to trace it to inside the FBI building. Who else was extremely frustrated that Tom just happened to walk in at the exact right moment to overhear their conversation? This story line better have a huge pay out considering how much it's been dragged out. I mean it, stuff better hit the fan by the end of this. Theo is using his hacking skills to play around with Ryan. When those cops pulled him over, I assumed they were working for him and were about to kidnap Gwen. I was relieved when that didn't happen, but that doesn't make me any less worried for her, especially now that she's pregnant! At least now I'm feeling more confident that Gwen is not one of the bad guys and is actually who she says she is, so that's also a relief. Theo recruits a new friend who just happens to be a guard at Joe's prison. That was a pretty creative way to have a conversation with him. I'm actually glad the new friend didn't last too long; Theo works better on his own. Now Joe has fashioned himself a weapon out of the guard's sunglasses. From the promos, it looks like he'll be putting them to good use. We all knew there was no way this execution was going to go off without a hitch. Ryan's having nightmares about Joe and meeting him in the prison nearly drove him to drink. He would have if Gwen hadn't startled him. He's falling apart and clearly needs some help. Will Gwen tell him about the baby? I don't know what that added stress will do to him right now. Really, not much actually happened in this episode. Our agents are not any closer to finding Theo or Mark/Luke. They know about the laptop and assume they have another mole, but the laptop was destroyed before they could get to it. Also, is Tom even a mole? We still have no idea what his plan even is. 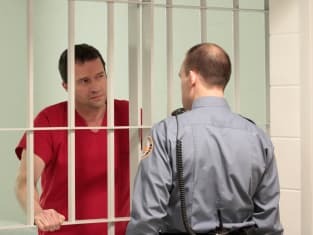 I'm curious to see if Joe manages to break out of prison, and if so, what will come of this key Theo wants from him. I honestly can't see the two of them working together. What do you think Mark and Daisy have planned for Mike and Max? I have to assume that the writers weren't ready for Max and Mike to find the laptop because they wanted Mark and Daisy to keep spying. I'm looking forward to seeing what they have up their sleeves. Remember, you can watch The Following online any time! All the agents in the world won't be able to save you. You need to be punished for what you did to me and I'm just getting started. Mark: I found you! Now it's time for you to pay. Daisy: Please, please Mark, please don't kill me please. Mark: No no, Mark drowned. I'm Luke. Permalink: No no, Mark drowned. I'm Luke.